PRO BOXING GLOVES: Offering high levels of protection and able to absorb what you want to give out! 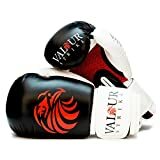 BOXING GLOVES: GEL INFUSED & MULTI LAYERED V-IMPACT FOAM: Reduce the chance of injuring your fists. THE BREATHABLE MESH PALM OFFERS INCREASED HYGIENE EFFICIENCY: Unwanted odours and bacteria are allowed to escape. Offering all the professional features at an unbeatable price. Built to protect the most aggressive heavyweight punchers from injury, these gloves can take what you want to give out! Ensures even strike wave distribution throughout the glove upon impact. The condensed and professionally placed shock absorbing foam protects the whole fist. enables fresh air flow. The ventilated mesh palm enables the glove to effectively breathe during and after use. This allows sweat and unwanted odours to escape freely. Ensure that the gloves are securely attached to the athlete, the fitting can be adjusted easily throughout training. The 3 inch strap offers increased wrist support when striking. Creating a stable connection and preventing wrist injuries.